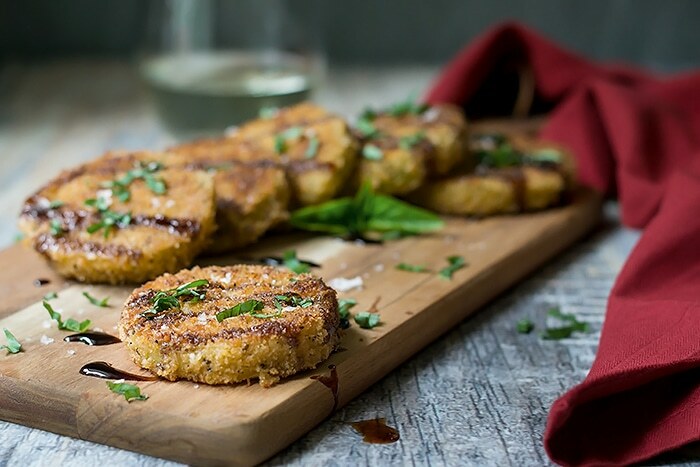 Crispy pan fried green tomatoes drizzled with a balsamic reduction and sprinkled with fresh basil. You wont want your tomatoes to turn red anymore. 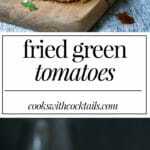 I had never tried fried green tomatoes until this year. I had a few huge tomato plants in my garden this year, but for some reason they didnt produce until late in the season. Not enough sun I guess??? I was a little disappointed but when Debbie saw all my green tomatoes she got excited. 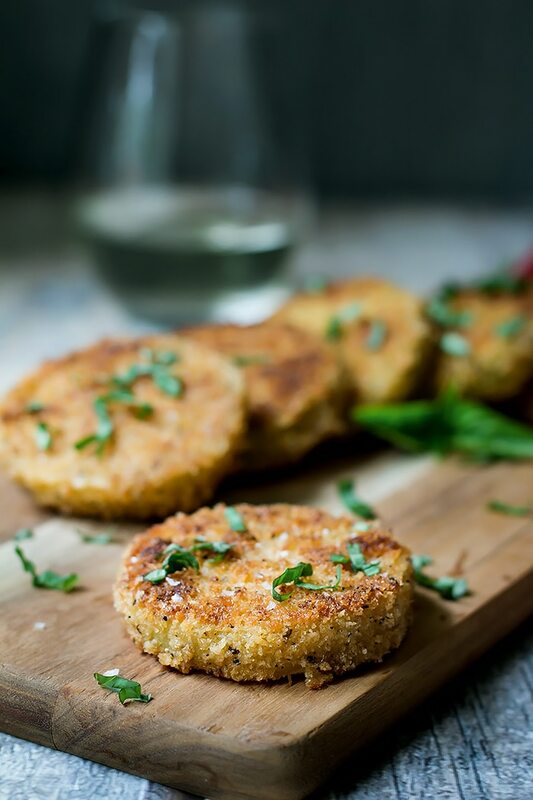 She and Mark stayed the night at our place that night and in the morning we made these fried green tomatoes for breakfast. Debbie told me that she first had fried tomatoes when she was about 10 years old. Her family was at her Uncle and Aunts place in Sylvan Lake, Alberta. They lived right across the street from the lake and her parents and brother would go there often. In the summer they would take swimming lessons in the lake and then in the winter they would skate and ice fish. Debbie’s Aunt and Uncle had a fire pit in the back of the house and her Uncle Joe would cook fried green tomatoes in this big cast iron pan over the fire. When he cooked the tomatoes he used butter only and they were so delicious. They served the fried green tomatoes with toast and more butter, of course. This is how Debbie ate them for many years. 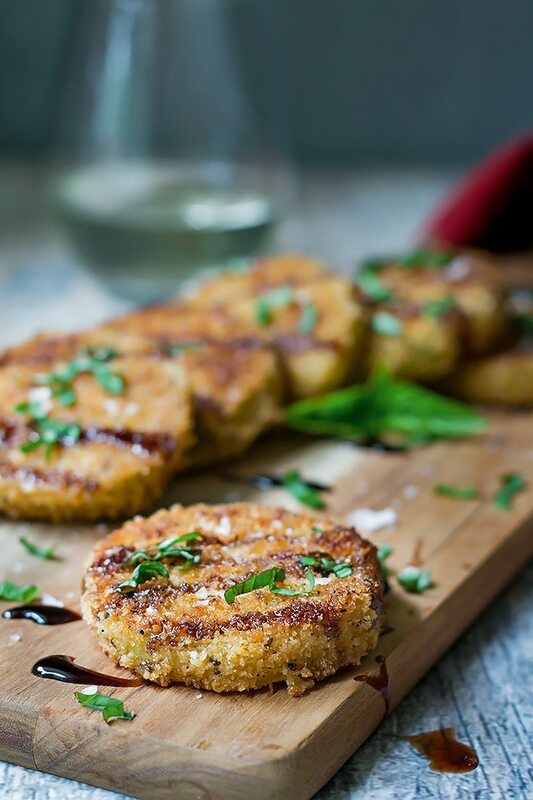 We dipped our fried green tomatoes in panko mixed with some herbs and Romano cheese. You could just season your own bread crumbs, but these ones came pre-seasoned. You would just add some grated parmesan, any dried herbs you like, and salt and pepper. We also cooked the fried green tomatoes in a mix of butter and olive oil. You can use oil only too, but a mix tastes better. 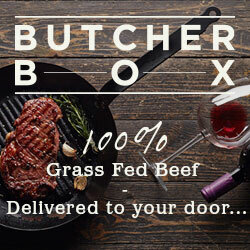 If you use grass fed butter, you don’t have to feel too guilty about it… You wont feel guilty at all when you taste it! I didn’t want to eat the fried green tomatoes with toast so I tried them plain and then I had a light bulb moment. What if we put balsamic reduction on them and sprinkle basil on top? Debbie was into it, so I grabbed the balsamic and some basil that was left on my plant outside. Our puppies had ripped out two of the basil stalks the day before, but I still had one left standing. I guess I caught them before they could destroy that one too. Bad dogs! They have so much fun doing bad things! They ripped the weather stripping off my patio door the other day too! Grrrr. Anyways, we tried it and OMG, who knew that fried green tomatoes would be so freeking good! Im not sure that any of my tomatoes next year will last long enough to ripen to red. 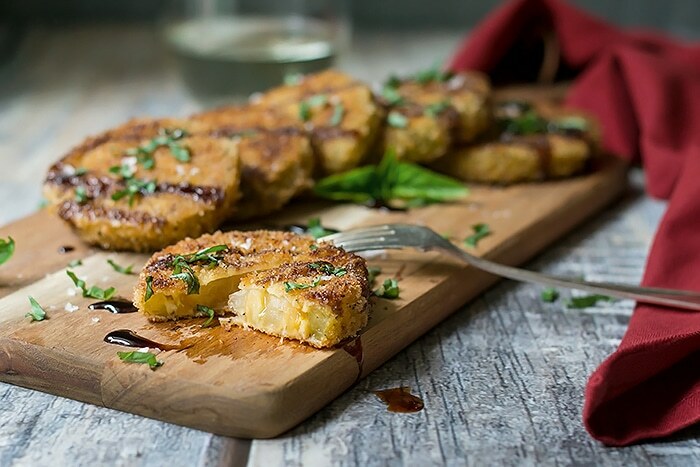 Want another way to use your Fried Green Tomatoes? 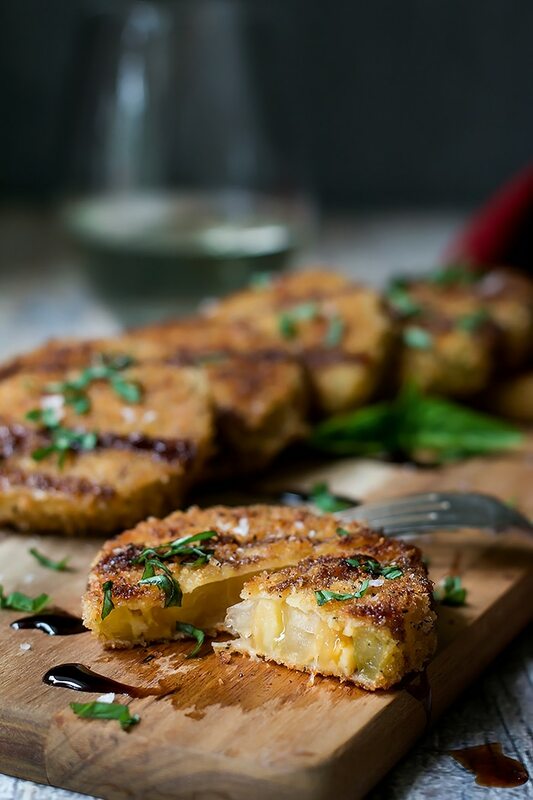 We love our fried green tomatoes eaten just like this, but we also LOVE them in a fried green tomato BLT! In a bowl crack the eggs and add milk and beat together. In s second bowl add the flour. In the last bowl add the panko crumbs, cheese, and seasonings. Dip each of the tomato slices in the flour first and coat evenly then into the egg mixture evenly and lastly into the panko crumb. Repeat for all the slice tomatoes. Turn a burner on to med high and in a large frying pan add butter and oil enough to get the crumbs coated nicely to brown the panko crumbs. When the tomatoes are nicely browned on one side flip and add a little more oil and butter mixture till the other side is nicely brown. When all the tomatoes are nicely browned, put on a plate and drizzle the balsamic reduction over the tomatoes, sprinkle with chopped basil and salt and pepper to taste.